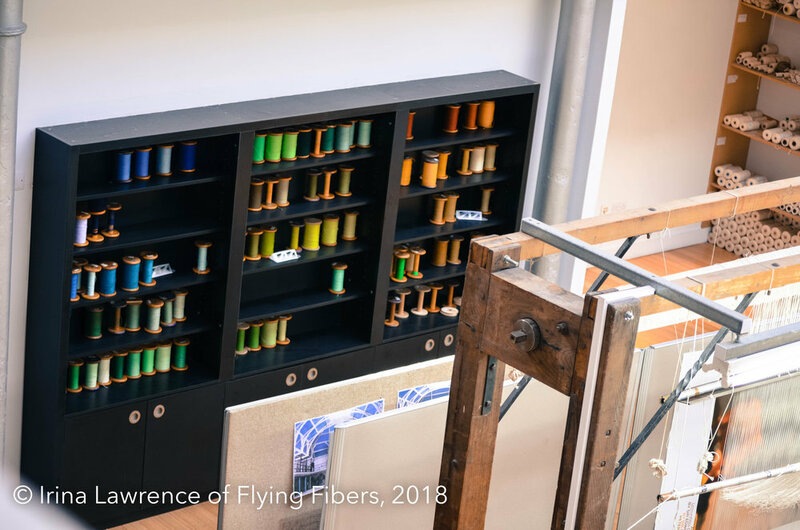 As we start to move into the month of April, which hosts the worldwide annual event, Earth Day, I think it is important to look at the ways Flying Fibers is committed to being more sustainable, and eco-friendly as a business. Firstly, we wear wool! We also have sheep that grow wool for you (and us!). Wool is an incredible fiber and textile which is completely sustainable, fire retardant, renewable, reusable….I could go on forever. I think that this graphic from the Campaign for Wool describes it best. Secondly, when dyeing we reuse water as much as possible. We made the conscious decision when starting our Yorkshire Medley yarn line to use earth-friendly, low-metal dyes. This means that the dye fully absorbs onto the fiber, and we can reuse the water in the dye pot until the end of the dye day. Even at the end of the dye day, there is no dye material left in the water, and therefore clear, clean water is being discarded. When you think that Jeri can dye up to 350-400 skeins in a weekend, that is a lot of water preserved! Third, within our yarn shop, we work with companies who are working hard to minimize their carbon footprint. All of the companies we carry have traceable materials, sourced within their country. This is also why we specialize in USA or UK made products, the companies use wool from traceable origins, which means no importing from incredibly far away! We also have a few other ways to promote sustainability within our yarn shop. We heavily encourage customers to bring their own shoppers for when they checkout. This reduces the number of paper shoppers we give out in the day. Plus if you let us know that you have brought your own shopper at checkout, we add a little ‘thank you’ perk to your receipt! For when we hold events at the shop, we have reusable mugs to use instead of throw-away hot cups for coffee and tea. For cold drinks, we have cups made with corn-based PLA, which is a completely compostable material - we also have utensils made out of that material, for when we can’t help but celebrate something with sweets and treats. We hope that as you go into April, you think a little bit more about how you can reuse, reduce, and use wool - I know we will! Over the Sea to Skye: the Highlands! Welcome back to the second post! I hope you enjoyed reading the first post about our Over the Sea to Skye trip last month. After our fabulous time in the lowlands, it was time to travel up to the Highlands! I will admit that quite a few of us were hoping to see Jaime Fraser wander down from the mountains, but alas, just lots of lovely sheep! Our first stop on our trip through the Highlands was at the Knockando Woolmill. There was lots of deliberation on how to pronounce the name of this fabulous mill. The workers and locals said "Knock-CAN-du," yet the farther north we got, the pronunciation was split up like "knock-an-du." I think we'll stick with how the locals say it! We were fortunate enough to get a behind-the-scenes look at some of their older mill equipment, like their fabulous old spinners and looms! The older weaving equipment is still used to weave high-end tartans for the older Scottish clans that still run estates! Knockando still gets wool from local farmers in the area that come in big bales to the woolmill. They are stored in this fabulous building! But not everything is done the old-fashioned way, they do have high-tech looms which run automatically, and create stunning tartans in a matter of minutes. Our next stop was the Cardhu Distillery, where we met the kindest Highland Coos and got to see the whisky distillery process. Cardhu was originally founded by a woman in 1811, and while they still make some of their own branded scotch, most of what is distilled there goes into Johnnie Walker whisky. Afterwards we drove to our hotel in Grantown-on-Spey and enjoyed a lovely trunk show with Julie from Black Isle Yarns. Her yarn is absolutely lush and I cannot wait to knit up something fantastic with the skein of naturally-dyed local wool I got from her! Finally, we went over the bridge to the Isle of Skye. Around every corner, there was another beautiful scene to be seen. I have never experienced such lovely views in my time travelling in the U.K. You also cannot begin to imagine how LOVELY and high the mountains are. I know it is called the Highlands, but we have nothing like it in Pennsylvania, so it was incredibly impressive. We took a Dorset Button workshop with Tania of TJ Frog. It was such a fun class, complete with the best tea and scones from the Skye Baking Company. I am already planning my next sweater, complete with Dorset buttons to commemorate the trip! Whilst we were in Skye, we also got to visit Island at the Edge croft. Yasmin is a shepherdess and handknitter who has groups come to her farm. She raises Hebredian and black Cheviot (Chee-viot, not Shev-iot) sheep. We learnt about knitting with long pins (double pointed needles that were at least 12" long), and also had a demonstration on spinning and preparing fibers. Mum fell in love with one of the rams on the farm, so it is probably a good thing you can't import livestock nowadays, otherwise we would have had a new addition! That evening we ate at SKYE Restaurant which was in a lovely old building on the tip of the Trotternish Peninsula, which held the most incredible views. Afterwards we briefly stopped to snap some photos of The Old Man of Storr. While we were on Skye, we got to take a felting workshop with Ann Salter of Dragonfly Studios. We made the loveliest brooches with a really fun wet-felting method! Even though I had wet-felted in the past, I had never done a technique like this. It was a ton of fun, and made me really want to start wet-felting again. Not to mention that Ann and her daughter were fabulous instructors. 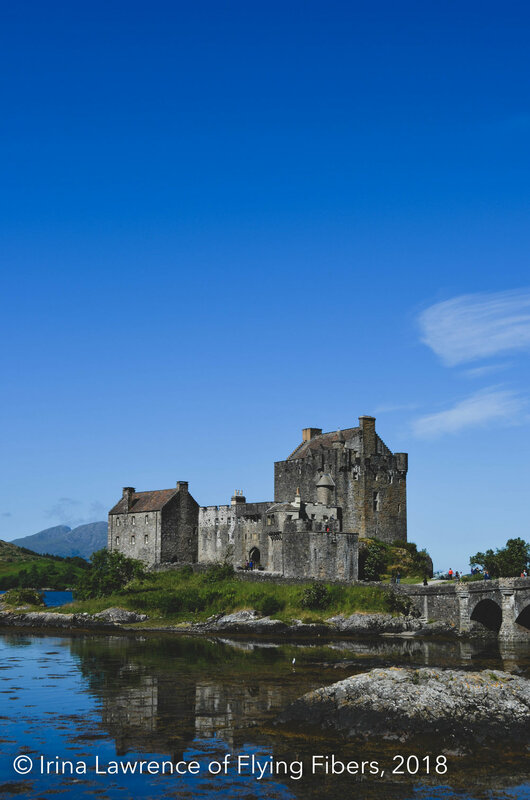 We took a quick trip to Dunvegan Castle and Eilean Donan Castle, too. It was nice to be able to visit some historical sites and see how the castles have been maintained and updated over time. Along with the castles, we went to the Highland Folk Museum where parts of Outlander had been filmed! We got a behind-the-scenes look at the textile archive at the Folk Museum. It was amazing to see all of the textiles laid out. With gloves on, we were allowed to handle and inspect all of these beautiful artifacts, although I was so busy looking at everything I forgot to snap photos! While our time on Skye was nothing short of spectacular, it was time to head back over the sea, down through the Highlands and back to the Lowlands for our last days. We did have a quick overnight stop in Pitlochry before making our way down to St. Andrews for our final class with Karie Westermann. Our course was Knitting the Landscape - a perfect conclusion to a whirlwind trip! It was fantastic getting to listen to everyone recount memories of the trip as they had seen it. Then Karie would challenge each person to put that into knitting a swatch. But at the same time, being traditional was not the goal, it was about using textures, and color changes, and other techniques to evoke the feeling of the memory without just making a faire isle picture of that memory. It truly flexed our knitting brains, and was a fantastic way to end the trip. Not to mention, we had the class in a classroom at St. Andrew's which was beyond stunning! So I hope that you all have enjoyed the photos and little quips about our time in Scotland. Look out for our next trip abroad in 2020! We hope that you will join us! Hello there! This blog post will be a bit different from the usual farm chatter. Last month, Jeri and I took a group of shop customers Over the Sea to Skye with the help of Heather, a fabulous knitting travel agent! In this first blog post, I will reflect on the first half of our trip, and share photos from our time there. I hope that this stunning display of scenery and history will entice you to join us for our future trips, as we had such a fantastic time! So let's get started, shall we? Welcome to Edinburgh, the city of bright colors, lovely people, and of course some fab yarn shops! There was such a stunning amount of architecture throughout the city, we were so fortunate to be able to explore this place during the first few days of our trip. With a stunning view of the Edinburgh Castle from where we were located, the city was a charming mix of old, new and organic. 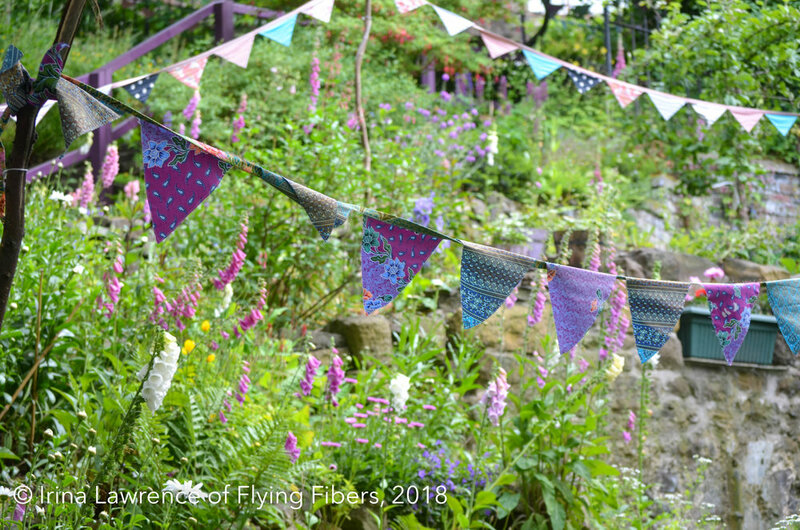 Whilst walking around, you could find ancient buildings, geometric patterns, and the prettiest foxglove gardens complete with bunting blowing in the breeze. While we were in Edinburgh we got a tour of Dovecot Studio and got to see the weavers in progress creating the most lovely tapestry pieces. In addition, they had a lovely gift shop filled with the nicest things, all handmade by artists throughout the UK. We had a lovely tea at the Tower Restaurant which sits on the rooftop of the National Museum of Scotland. This was after having a guided fiber arts tour through the museum, looking at the textiles throughout the whole museum from various eras. While we were in Edinburgh, we did a yarn crawl too. In the excitement of it all, I did not grab photos, but we were lucky enough to visit Ysolda's private studio full of lovely yarn goodies. In addition, we hit up Ginger Twist Studios, the smallest but most brilliant yarn shop in Edinburgh (lots of hand-dyed loveliness), and finally, we visited Kathy's Knits, which was full of lovely wooly Scottish yarns from various mills around the country. After an absolutely fun-filled but busy time in Edinburgh, it was off to the Highlands! Join me in my next blog post as we explore the Highlands, and travel Over the Sea to Skye. DISCLAIMER: Jamie Fraser did not appear in the Highlands while we were there. But there were quite a few kilts walking around! Hello friends! I seem to be on a roll with posting, which is probably because I am avoiding all sorts of schoolwork (kidding, I'm well on my way and this is how I take my breaks). I wanted to chat a little bit about a concept that we will be employing a modified version of on the farm starting this summer. It will be a long-term endeavor but we believe that it will be ideal and incredibly important for our pastures and the animals we raise. If you remember from my prior blog posts, we are always trying to rehab our pastures. We had our soil tested late last year, and then had all the appropriate nutrients/fertilizers/minerals spread on the pasture. It has been tough though, keeping all the grass staying lush as there is no reprieve for it since there is only shade along the back fence line. The pasture this morning at 8am, already exposed to blazing heat and direct sun. A few weeks ago Jeri and I were approached by a preservation farm to be the sheep resource for them as they start to implement a concept called Silvopasture onto some of their unused pastures. They want the full benefits: shade, forage, and meat. The goal is that this ecosystem will be able to support itself and others, and it would also be possible to rotationally graze which would be best for the land. While we were researching it, a lot of the trees that are recommended are ones that are already heavily growing on our land. Since Pippa is full-time at the farm, Jeri and I have been going out for chores early in the day and quite late (to give her a bottle), and so we can see the pasture in its entirety at times when we had not been paying close attention before. We have noticed that the grass responds best to the high canopy shade along the fence line, which would make the most sense because it is sheltered from the blistering sun that hits the rest of our land. Therefore we decided to start implementing a modified silvopasture concept onto our land. We think that it will be ideal for our animals, it will help the grass grow, and it will also lower the temperature at the farm during the day. Mutually advantageous across the board. We will mainly be planting Locust and Poplar trees, which already run rampant in the wooded side of our property, they will provide the lovely high canopy that provides the shade. We are kicking around the idea of also planting some forage trees, which we could harvest or the sheep could nibble on. The silvopasture works with the contours of the land it is put on. The large number of roots from the trees will help retain water, thus growing deep-rooted grass and strengthening the ground for when massive rain storms come through. It will also allow us to let our chickens free range for longer amounts of time as they will be sheltered from any immediate predator. You can see what a difference this process can make on a plot of land. We are excited to put this idea to work, and hope to start buying trees later this summer and get the first row in for the season! In Part 1 of this blog post, I introduced you to our first four lambs, Minnie, Ginny, Pippa and, Poppy. We have 12 lambs total on the ground (1 more since I wrote my first part of this post), and so allow me to introduce you to them all. These babes are Shetland cross lambs. Born on April 26th, these little girls are growing like weeds! Their wool is so interesting: sticky like a Shetland fleece, with the structure of a longwool. We are excited to see how these two girls grow out, and will definitely keep them as part of our crossbred flock. Are you keeping count? We're 6 for 6 with ewe lambs at this point in the season! The best part about Shetlands is that they are a landrace breed: they have been domesticated, but still hold onto their primitive instincts. I arrived at the farm after work to finish chores on May Day and saw a tiny black sheep and a tiny white sheep hanging around by Dot. I though that it was quite strange that Minnie and Ginny were with the wrong mum, until I saw that Minnie and Ginny were with Char. I pulled into the driveway and ran into the pasture (past all of the hungry rams mind you), I got into the ewe pasture and sweet Dot was grazing and these two lambs were standing near her. They were DEFINITELY Shetland babies, no doubt about it. They were dried off, walking, and baa-ing to their mum before nursing. What a great mom Dot is, and what instinctive babies they are. While this photo was taken the day they were born, Graham (black gulmoget ram) and Hilda (white ewe) are now the chubbiest little babies, and are growing more and more everyday! With Graham being the tipping point, we were up to 7 ewes and 1 ram. Then Stella, our sweet Teeswater ewe, had her water break while Jeri was doing chores in the barn. On May 9th, in smallest to largest order, Stella (with Jeri's help), delivered her 3 little ram lambs. The neighbor boys named them Oscar, Oliver, and Owen: which are perfect names for these lads. Stella is being a great mum, and we're shocked that she still has enough milk for all three of these rascally rams. Say hello to Raina! She was the last lamb born this season. Her Mum is Timi (Leicester Longwool/Wensleydale crossbred), and her dad is our Teeswater ram, Sk8r Boy, so she is a proper longwool cross! She is officially a week old today and is getting more adventurous as each day passes. We think that she will be a beautiful addition to a spinners flock. 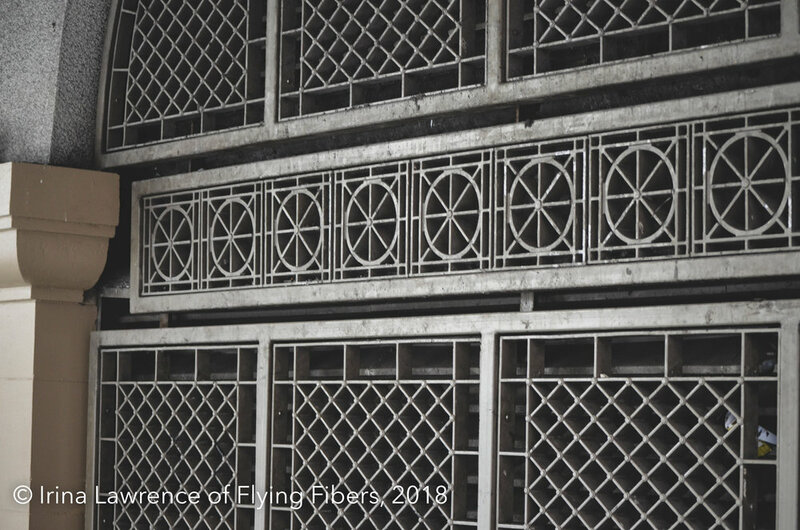 Thank you for following along in this blog post. I can't wait to share more photos of the lambs as they get older! Hello! It has been almost a year since my last blog post, and for that I am quite sorry. It seemed like the last year has flown by. Honestly it has! July was filled with repainting the yarn shop and sending wool off to the mill. August was the month we put new floors in the shop. September we released our Barrow Collection, designed in Yorkshire Medley, but will also look scrumptious in our newest batches of flock yarn. October was Knitters' Day Out and Rhinebeck: perfect chaos needless to say. In November we celebrated 8 years at the yarn shop, and small biz Saturday. December was full of Vogue Knitting: NYC preparations and holiday bustle. February we enjoyed weekends away knitting. March was spent preparing for lambs, and finally in April we started lambing! Our first lambs born this season were Minny & Ginny on April 19. Longwool cross ewes to Char, who is the BEST mama around. They were large and cleaned off by the time we went out to feed. Those are the best kind of births: effortless. The next day, I got a frantic call from Mum, "I need to get to work but the babies won't eat!" Being quite confused since Minny & Ginny had been fine the prior day, I asked why Char wasn't letting them feed. Mum responded "Oh no, we have two little Orla's. Sweet girls!" So after some chatting, I left work and ran to Tractor Supply for all necessary bottle baby supplies. After making it to the farm, I found Mum on a conference call (she was not going to make it to work in time) while trying to get the two lambs to nurse! The one girl, who was double the size, was standing and nursing quite well. The other one was very small and was having trouble standing. We finally realized her back legs were weak, therefore inhibiting her abilities to nurse. We took this little one on as a bottle lamb. We named them Poppy and Pippa (the bottle lamb). Pip still comes into the yarn shop with us for work, but she is getting a bit heavy to carry places! Needless to say, it was a crazy start to lambing! Check back in at the start of next week for Part 2 of this blog post. Good morning! I hope that you're all having a wonderful first week of summer. I know that we are! Over the last few weeks we've had really wonderful additions to the farm, who I will introduce later in this post. At the end of May, Valerie Buller, a local photographer asked if she could come to the farm and take some photographs. Of course we said yes! We spent a wonderful evening with Valerie while she captured Jeri and I working with the animals. It was a truly wonderful experience, and we are so grateful to Valerie for capturing the spirit of the farm and our sheep in each photo she took. Valerie taking some product shots with the sheep involved. Please feel free to check out more of Valerie's wonderful photographs under her Rough Coat Photography business here. 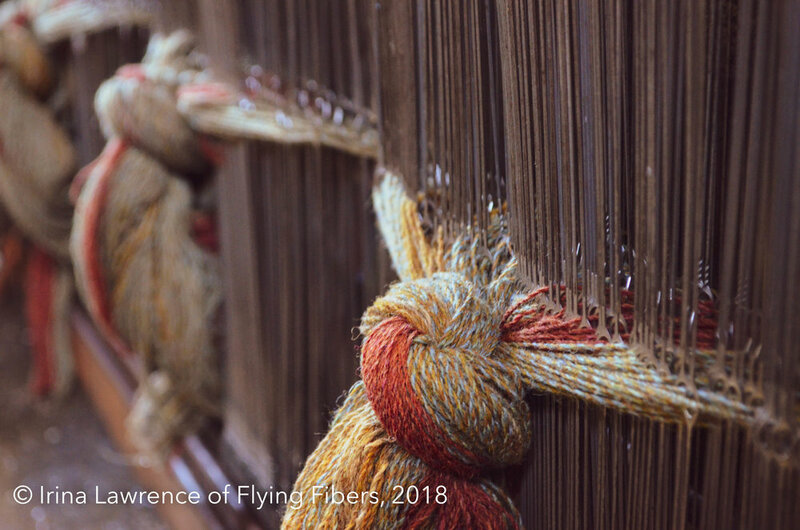 At the start of June, Jeri and I went away to Vermont to participate in the New England Fiber Art Summit. This 4-day intensive event was hosted by Tammy White of Wing and A Prayer Farm. Tam is an all-around great gal, who loves to love and nurture both all the animals on her farm, as well as all the guests who visit her! The weekend was filled with laughter, pie, and learning. We learned how to rug-hook, journal, knit faire-isle, use Calendula to natural dye, and we also learned how to knit traditional Shetland Haps! In between the classes, we ate wonderful meals prepared by Char, Tammy's daughter, and got to chat with some of the finest in the fiber arts industry. The teachers, the hosts, the students, and of course, Joan, Tammy's Livestock Guardian Puppy. We also participated in a sheep-wedding! We took Ash, our Wensleydale ram, up to VT, where he will live now, and he "married" 3 of Tammy's Wensleydale ewes. The groom with his bowtie on. Jeri and I came to VT with one sheep to sell, but went home to PA with two! While spending time in the pasture, Jeri fell in love with a little Shetland ewe named Dot, and of course you can't have just one! Therefore, Percy, a Shetland wether (who became my buddy) also got to head home to PA.
After our whirlwind weekend away in Vermont, we were able to get the sheep shorn, and all of the hot lasses and lads are enjoying the breeze sans fleece now! Kuzco and Marley, post haircut. Farmer Matthew and Shepherdess Jeri have been super busy at the farm, starting early in the mornings to reclaim land and fence in a new pasture for breeding/lambing/quarantine. They have been working hard over the last few weeks to cut down brush, mark out post holes, and put up fences and gates. I've been in the store tending to customers and putting out yarn, in addition I've had OODLES of fleeces to skirt in hopes we can pop to the mill before the end of the month. Putting up the gate to mark the new pasture area. Good afternoon! Whilst writing this post I am curled up on the couch with a cup of coffee and my most current knitting project. The last few months have seemed to speed by. One moment I hit "publish" on my last blog post, and the next moment we're nearing the end of the University semester, and have completed MDSW. This year was truly an enjoyable show, despite all of the rain. We met lots of lovely people and got to catch up with old friends. We brought an abundance of Yorkshire Medley, and the rest of our flock yarn among other things. Over at the farm, our last few months were spent aerating and seeding the pasture. Can you believe that 2 years ago we had just started looking at a plot of meadow and forest that has transformed into our farm? But yes, you heard me correctly, we purchased a meadow with weeds and barely any grass; just stalky greens shooting up each season with no nutritional value. Therefore, even 2 years in we are continuing our rehabilitation of the pasture. All the hard work is seeming to pay off, as each day the pasture looks more and more green. We seem to be settling into a good rhythm moving into the summer. As long as we continue to get steady rain, the pasture should continue to flourish. Jeri and I have been quite busy skirting fleeces and making fun new things for the shop and festivals. You can find them for sale in-store, or online. Next up, Jaime, our friend and local hand-dyer, is getting ready to use fiber from Susie our Wensleydale to try her hand at lockspinning. Want to grab some locks for yourself? Head on over to this page of our online store, or stop at the shop during regular business hours to check them out in person! Also happening at the moment, I'm currently the guest poster for the PA Women's Agricultural Network Instagram page. Head over to https://www.instagram.com/pawagn6954/ to check scenes from the farm until this Saturday! Flying Fibers is pleased to announce that we are in the top 10 of Selective's #thinkBIG competition! We move on to the next round now and winners will be announced May 17th. Thank you all for your support. Since the last post we have gone through multiple months and a season. Our winter schedules were packed with planning, working, learning, teaching, and farming. Almost directly after the last blog post, our Speckled Sussex Hens started laying. We had 3-4 eggs a day for the longest time. The Speckled Sussex are known for laying in the colder months, and we were always excited each day to collect our eggs from the coop. We were "egg"sploding...or so we thought. We are now getting about 8 eggs a day and we are getting really great at making quiches or omelettes and giving our farm fresh eggs away to friends. The winter was grey and gloomy, with unseasonably warm days that even had the sheep sweating. I finished a pair of mittens out of the last skein of our Natural Black Wensleydale DK yarn for my Mum in February, on a day that was 56 and sunny. I know that these mittens will be appreciated next winter, and they hold the fleeces from all of Mum's favorite sheep, and that makes it so special. 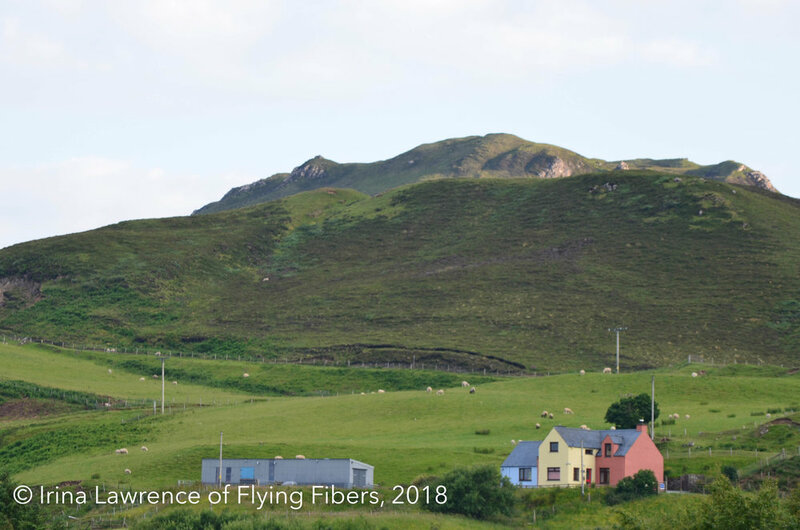 After a whirlwind time hiking our way up to NYC to bring the longwool love to the big city at Vogue Knitting LIVE, we settled into the hills of Lebanon County for our second annual fiber arts retreat. It was such a fabulous weekend away with a great group of ladies full of fiber inspiration and cheery chatter. Thank you again to all who participated, and a special thank you to Farmer Matthew for holding down the farm while Mum and I were gone. At least this year Fred didn't break down a fence to get to the ewes! Once we hit February, the weather started to get strange, with days so frozen the sheep didn't have soft ground to step on, or other days so hot that they were panting while waiting for their feed. All of these ups-and-downs with temperature brewed a tornado to hit our area, luckily there was barely any damage to our place, and the animals weathered the storm well. The pasture started greening up immediately after the heavy rains, and for a few days, we caught glimpses of spring. Light breezes, greening countryside, 50 degree weather, and soft ground. It was so beautiful, and all the animals were having fun frolicking in the fields while they could. The Spring didn't last long; enter Winter Storm Stella. Thankfully, we only received 12" of snow this year. 1ft was much more manageable than the 2.5-3ft we received last year with Winter Storm Jonas. We were able to safely get out to the sheep, and Farmer Matthew's snowblower was even able to tackle this snow with no trouble! So, we're back to Winter Farming. Frozen water buckets, shoveling snow off the roof of our temporary Lad (in-tact and young rams) shelter, but also sledding! The sheep are handling this level of snow much better than last year, and we're hoping all of this moisture soaks into the ground and grows some grass seed from last season. Now I'm going back to winding Yorkshire Medley so that Mumma can hit the dyepots before MDSW. New friends and good wool! I'm starting this blog post watching the snow fall around a beautiful 65-acres farm nestled in the hills of Delanson, NY. We are currently set up at our friend's farm waiting for the weather to lessen to go out to the barn and meet our newest flock additions. Jeri and I are welcoming two new Wensleydales to the flock, and two new Teeswaters. Yes, you read that right! We are introducing Teeswaters to our flock of rare breed British longwools. We have admired the Teeswater fleece and wool for some time, and Virginia kindly has set us up with a breeding pair. A beautiful ram lamb, and an aged ewe. Virginia owns The Yellow Farm in New York. She is known for her high quality fleeces, her prize-winning sheep, and her love of the fiber arts! You may have seen Virginia at Vogue Knitting LIVE: NYC with her lockspun garments and yarn, or showing her sheep at Rhinebeck. She can be found online partnering with her friend Pam to bring you Shepherd's Talk. Getting home with our new sheep was definitely an adventure! We were able to get on the road around 2:30pm once the plows moved through the area and salted/plowed the roads. That morning was not wasted at all! We were so fortunate to spend some time working through NAWSA business (check out the new website! ), drinking coffee & tea, knitting, and clearing snow away from the truck. Those my friends, are knee high muck boots. It was a deep snow for sure. All four of our new babes were loaded into the trailer and off we went! The roads in New York were splendid even though the snow was getting heavier and the winds were blowing harder. Proper grit on the highways and clean roads made us feel safer as we pulled the trailer with our precious cargo inside! We crossed into PA around 4:30, and as we found our way onto the I-88/I-81 interchange, we slowed to a crawl (8mph) as the line of cars in front of us made their way along the snowy road. Oh boy. After an incredibly long and stressful 200 miles of low visibility and/or slick road driving, we got to Wilkes-Barre to find clean, dry roads with no flurries clouding our view. Only then did we breathe a sigh of relief. The next 100 miles home seemed leisurely compared to our crawl down from Northern PA. We got to the farm around 10:30pm, moved some rams into our third pasture so that the new rams could have a stress-free transition into the flock, and then walked our two new ewes down to the girl pasture. Everyone integrated well into the flock, and as the days get chillier, I am so happy to be wrapped in massive wool shawls made from our flock yarn. So without further ado, welcome warmly to the flock Stella, Sk8tr Boy (named because we were "skating" through PA at 8mph on I-81), Athena, and Phillip. To finish out a whirlwind weekend celebrating our yarn shop's 7 year anniversary and Small Business Saturday, I cast off this adorable mitten. The pattern is Acorn Mitts by Ashley Yousling and I knit it in our Timi & Friends yarn which is oh-so-soft. Since the largest size of this pattern uses under 200 yards, any skein of our flock yarn would work perfectly! Knit wool. Wear wool. Love wool. It's currently fall break for my University, which means that Mumsy and I have more time to Rhinebeck prep! We are so excited to be spending our first year at Rhinebeck as a vendor, and our 4th year as the North American Wensleydale Sheep representative. Come visit the Flying Fibers booth in Building 36, Booth 19 for lots of flock goods and Wensleydale wares! If you fancy a sheep hug, pop down to Building 28 and visit the Wensleydale booth to chat with Jeri about Charlotte and Penny (4 year old ewes) from our flock. The drought was really tough on us this summer. In the spring, we seeded the pasture, and had some vital rainy days which helped the grass flourish. It was the first big step in rehabilitating the pasture. Then the drought came and the pasture couldn't handle the heat and lack of rain. Back in September, my mom and I spent a whole weekend seeding both pastures. So we seeded, and it was a lot of walking up and down the pasture, and hoping for rain. With bated breath we waited for the smallest sign of green, and then it happened! Now we admire our "green haze" and are so relieved that we have some established grass so that when we seed again in the spring, it should grow back even more lush. So, moving on from the boring pasture chat. Annie Rowden of by Annie Claire has designed a gorgeous shawl using our Yorkshire Medley yarn. It is a very beautiful shawl that will be perfect to wrap yourself in throughout the winter. The pattern is called, Bahaal, which mean restorative. The shawl follows a Fibonacci sequence which also makes it a very intuitive pattern. It would look GORGEOUS knit up in our Natural Black North American Wensleydale yarn if you want to try knitting local. We are welcoming the change of seasons with open arms and happy hearts. The summer drought has been pretty tough on us as we try to rehab the pasture from the scrubby meadow it was when we first bought it. The last few months have been a whirlwind of activity, and even though everything should probably have slowed down since we're now heading into the fall semester at University, it didn't. In the first week of August, we flew over to the UK to attend my cousin's wedding. While we were there we stopped at our dear friend's farm for a couple of days to experience sheep. Jeni Thomson of LadyGrove specializes in Wensleydale and Leicester Longwool sheep like we do! She loves the gene pool preservation aspect of raising rare breeds and that is her drive to produce quality stock. We got to spend a day and a half weighing and grading the sheep, all hands on! It is a fabulous experience that really helps us come back to our flock and compare. While Jeri and I were staying with Jeni, we convinced her to get out her old fiber processing equipment and we spent our last afternoon with her skirting, picking, carding, and then spinning some of her fleeces that she had been saving up. Overall it was a beautiful time and we are so grateful for an amazing friend like her! Returning back to the states we were met with the exciting news that we were accepted into the New York State Sheep and Wool Festival as vendors! Jeri will be in Building 28 at the North American Wensleydale stall with a member from our flock (or maybe two! ), and I will be in Building 36, Booth 19 vending our wares! I encourage you to visit and learn more about our sheep. Since the school year has started, some of our animals have learned new tricks. For example, Sir Clive has learned that grain is the best thing in the world, and he will snuggle with you if you give him his own little bit of feed. Two of our hens have now become models! Two of the Speckled Sussex hens went to Millersville University and posed for the Drawing 1 class. How fun! This last weekend was spent vending at our favorite local show, Knitters' Day Out in Summerdale, PA. It's a day and an evening packed with fabulous classes and vendors. This year we moved to a double booth and were able to expand everything that we brought to our local shoppers! It was an enjoyable weekend full of familiar and new faces. The best part was how many people were asking about our sheep and interested in furthering their interest in longwools. There were a lot of people who made the "longwool leap" (as I call it) and purchased yarn to start knitting with stronger wool! Just saying "hi" in my British wool tweed blazer! Hopefully as the autumn season continues, we will be given lots of cooler day and some rainy nights to hydrate the pastures and keep the sheep happy. Until then, I'll leave you with this photo of Matthew, enjoying the hay with the sheep. July: it just flew by! It seems as though this summer has flown by! It’s reached a peak heat over here in PA and so our sheep are counting down the days until Autumn begins. Average temperatures have been in the mid-90 degrees Fahrenheit and the sheep aren’t too enthused. Luckily wool does act as an insulator to keep them a bit cooler, and they find a nice spot in the shade to lay and relax. After I posted the photo of our resident pumpkin, Princess Carrie, she delivered twins! She gave birth to Sir Clive and Lady Clementine, who are just too cute and quite rambunctious. They are full siblings to Cherry Blossom who was Carrie’s lamb last year. I finally finished the textured shawl previously mentioned that was knit using our Leicester Longwool yarn! It’s a gorgeous and incredibly large shawl that is wonderful for wrapping up in the evenings. The lustre of the yarn definitely adds to the finished project. Back on the farm, Matthew, Jeri and our friend RJ were working hard to build what we lovingly refer to as “Fort Knox for Chickens”. It’s the outdoor enclosure for our chickens so that they can learn their boundaries (i.e. laying in the coop or chicken yard). The wood you see in the enclosure was 100% sourced from our land on the wooded side. Trees that looked a little too rickety, or were getting just a bit too twisted were harvested and used to build this fabulous enclosure. We’ve had a couple of the hens out as a tester and they seem to be loving it, they are even getting used to the chicken swing! Finally we closed our July with heading over to the PA Organic FarmFest in Centre Hall. Jeri and I were in the Wool Village showing our wares. We brought a minimalist set up of Yorkshire Medley, and the yarns from our flock. Customers loved hearing the stories of each yarn and we really enjoyed the company of the other vendors too! We even got to spend our Friday evening with our dear friends, Michael, Jan, and Tess of Tamarack Farm Sheep & Wool. So even though July zipped by, we had all around enjoyable events happen throughout! York County, PA or Yorkshire, England? early April, posts are put in for the vegetable garden. It has been a charming early summer at White Rose Acres. We spent a lot of April putting in our vegetable garden and cleaning up around the wooded area of the farm. We had a week and a half of 80 degree Fahrenheit weather. It was a blessing and a curse all in one sitting. The freshly shorn sheep loved to kick up their hooves and run as fast as they could across the pasture. The ground was so hard and dry it kicked up dust and sounded like a team of horses coming up to greet us each time. After that glorious week and a bit of heat and sunshine, the rain moved in. Since then it has been fairly cool, rainy, and cloudy. It gives the grass a chance to grow, and also helps our newly planted vegetables get a good head start, but the pasture gets soggy quite quickly. The sheep definitely think that they've been transported back to their homeland of England, and are embracing the rain. Surprisingly they don't go into their barns unless it's raining extremely hard. You can regularly find them spotted throughout the pasture grazing on the newest green shoots that are popping up everywhere. Happy British sheep in very British weather. In other news, we received all of our flock yarns from the mill, plus some extras! This year we kept it breed specific instead of sheep specific. Our new yarns include Natural White North American Wensleydale, Natural Black North American Wensleydale, Leicester Longwool, and Timi & friends (a longwool blend yarn). From left to right: Natural White North American Wensleydale, Natural Black North American Wensleydale, Leicester Longwool, Timi & Friends. These new yarns are just waiting to be turned into something fabulous. I'm in the process of turning 3 skeins of our Leicester Longwool yarn into a simple textured shawl to show off this heritage wool. The beginning of May brought our 11th year at MDSW, as well as my 20th birthday. The weekend was wonderfully peaceful and full of friends, fiber, and laughter. It was really lovely getting to meet such amazingly talented folks who shared a passion for rare breed wool like Mum and I do! Our flock yarns were well received and we felt so proud to be able to tell people that the yarn was raised on our own farm (finally!). After MDSW everything calmed down again. Mum and I finished our regular semesters, she started teaching her summer courses and I started taking mine. We also received our first shipment of chickens! We brought home day old chicks in the middle of May-- 1 Polish, 5 Speckled Sussex, 4 Red Cap, and 5 Blue Laced Red Wyandottes. The sunshine came out for a couple of days and all the vegetables for this season were able to be planted. Our resident pumpkin, CWL Princess Carrie, heavy with lamb. So until next month, enjoy the weather, drink lots of coffee/tea, and keep crafting! The past month has been a whirlwind of events. It started out very wet with lots of rain, which was fabulous for our newly spread grass seed, although not so great for the poor sheep with their fleeces still on them. Our lambing season was short, which is exactly how we wanted it! We had two little ram lambs who will have their forever home at White Rose Acres. Jeri was giving a lockspinning class on the 13th at the shop, we got a text from our neighbor informing us that it looked as though one of our ewes, Britney, had her mucous plug coming out. We wrapped up the class, gathered our lambing gear, and headed to the lambing pasture to see what was happening. It was an incredibly rainy day, and chilly to top it off! While Mom threw some feed to the ram pasture to keep them occupied, I jogged down to the little lambing shelter, and when I peered in, sure enough Britney was definitely in labor. She was laying down and pushing slightly, when I looked closer I saw a pair of legs sticking out! Oh boy! My mom came down and said that I should check to make sure the lamb was coming out in the proper position. So, I put on my OB gloves to have a look, and there was a nose coming out! I helped the little lamb along and started warming him up. Surprise! It's a boy! Britney started nickering to him immediately and licking him off. The whole ordeal definitely took a lot of energy out of Britney since she's the oldest ewe at the farm, we gave her all the right vitamins and made sure she was as comfy as possible, but she looked tired. Due to the weather conditions, we decided it would be best to bring Britney and the lamb into our "ICU" pen. The ICU is a pen set up in the garage attached to the house so we can watch the sheep 24/7 and control the climate for them a little bit better than in one of the barns. It was an exciting Sunday to say the least! After a couple of days, we decided to name the lamb, Rocky Baaaaalboa, because he came out fighting! He may be small, but he is mighty. Our second lamb had a less exciting birth story. The Tuesday after Rocky was born (March 15, my dad's birthday! ), we were feeding the sheep after work/school. As Mom went to fill up the water tubs, I started walking to feed the ewe pasture. As I got closer to the barn, I noticed that we had a ewe who was hovering in the entryway. I thought that was strange because usually ALLL the sheep run to the fence when they see the food bucket show up. Then all of a sudden I notice stuff (the nice word for it all) hanging out her back end and a wet lamb trying to stand up beside her! "Oh my goodness, we have a lamb! Mom! Mom! Timi had a baby!" I quickly started herding the sheep away from the barn so that they didn't rush around the ewe and her lamb, feeding them along the farthest fence line. When I got back over to the barn our ewe, Timi, was licking off a BIG ram lamb that was already toddling around. We had known she was pregnant, but because of the size of her udder, we expected her to lamb 2-3 weeks after she really did. We took apart the creep area and modified it into a lambing pen, and moved the very food-motivated Mama and her babe into the pen and closed them in. Fresh water, a nice slice of hay, and some feed kept Timi happy while we checked over the baby and made sure he was healthy. She was a little bit annoyed when the ram lamb tried to nurse, because she didn't know what was going on as a first-time mom. We called my Dad and told him to bring straw over after work because we got him a birthday gift. That's how Richard II was born. He's a strong single lamb that continues to grow at an incredibly fast rate. March 26 was our shearing day. It was a decently early start with the shears being turned on at 7:30am, but with a lot of coffee and the crisp air to keep us awake and moving, we finished around 12noon. All of our sheep got pedicures as well as their haircut. We have 18 full fleeces ready to be skirted and sent to the mill. Below are some photos of our shearing day. So even though the month started gray and rainy, it ended sunny and green! Also, here's a sneak peek of our flock yarns at the mill! Pictured below is our 3-ply DK weight Wensleydale, it looks so beautiful! Special thanks to our mill for doing such a wonderful job with our longwools. February was a fairly calm month at the farm. We are patiently waiting for lambs to start arriving at White Rose Acres. To prepare I knit up my "Lambing Hat" using 100% Leicester Longwool yarn that I received from friends in Hollidaysburg, PA. Leicester Longwool is definitely one of the best fibers to use for hardwearing hats! I've worn this everyday since I finished it, and that includes when we spread grass seed on our pastures in 50 degree weather! In the last couple days of February, we experienced some lovely sun! It was a pleasant surprise when we went to feed the animals and there was a lovely breeze that accompanied sunny pastures and blue skies. All the sheep were sunbathing up on the hill, and when they heard the feed buckets clank they all got up and ran towards the gates, kicking up their heels with happiness. Our first sunny day of Winter 2016. Otherwise we are excited to announce we have a very limited run of our natural colored flock yarns for sale online (click here to shop) and in-store. Each product page has a picture and a little description of the sheep that it came from. From our farm, to your yarn, and grown with love in York County. From left to right: Nikolai, Lucy & Susan, Surrey, and Marley. Thank you for reading, and I hope my post at the end of March has some lamb photos in it! The vet was out today for a late gestation check-up on the ewes we bred and says that they are happy and healthy. Who loves hay? EWES DO. ...we decided to name the property White Rose Acres, to celebrate my father's Yorkshire heritage, as well as the heritage of the sheep we raise.